If you are a sports fan in the United States, you have a lot of options to choose from when it comes to sports betting on mobile. A wide variety of U.S. friendly bookmaker apps now exist for iPad, Apple Watch, iPhone and Android, that allow you to bet live in-play on your favourite College Football or NFL team. 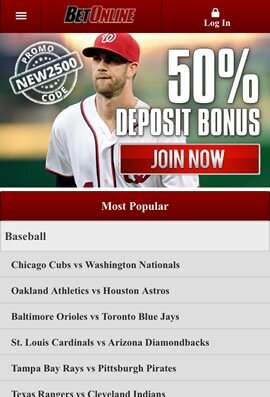 Fantasy sports apps also allow you to enter into daily competitions if you are an NHL hockey or MLB baseball fan. Bitcoin sportsbooks for iOS/Android devices have seen a huge surge in popularity because they allow United States punters to gamble anonymously and with lower fees. If doesn't matter if you want to watch a live stream, get betting tips or find the most competitive lines for American Football or horse racing, we've got you covered with our guide to the best U.S. sports betting apps. 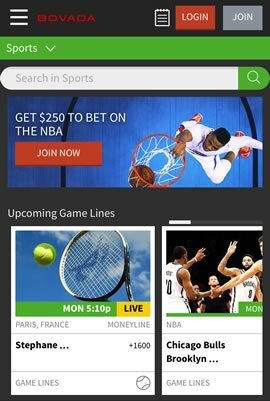 If you are a U.S. sports fan who's looking for high-quality sportsbook app then Bovada is streets ahead of the competition. They have invested heavily in their mobile bookmaker softare for smartphones and tablets and it shows. Bovada works brilliantly on any iPad, Windows Phone, Android or iPhone. Bovada is U.S. ONLY so expect a strong focus on NFL, NBA, NASCAR, golf etc. Unrivalled when it comes to fast payouts and credit card acceptance rates. Bitcoin is also now accepted. Make crypto deposits and withdrawals for free. Place props or future bets from your smartphone. Widest selection of bet types. Install from your phones browser in seconds. Zero restrictions in the USA. New players have a variety of sports and casino bonuses to choose from. Bovada is fully certified and licensed to carry out gaming and bookie activities. BetOnline is a highly regarded sports betting operation that has been servicing United States based sports bettors for over 16 years. They are based in Panama and welcome gamblers from all 50 states in the USA. BetOnline Mobile is browser-based so just visit their site from your phone. BetOnline offer earlier access to betting lines than other U.S. facing books. Very high wagering limits on all U.S. leagues, including NFL football and NBA. When you place your first in-play bet, BetOnline will give you a $25 free play. Place Straight, Parlay & Robin, If & Reverse, Teaser & Please bets from mobile. You can also play online poker and casino games on your Android or iOS device. BetOnline now accepts bitcoin and litecoin deposits and withdrawals. No fees. There is 50% bonus up to $2,500 with no expiration. 6x rollover required. Bait is a new peer-to-peer social betting platform for iOS devices that allows allows user in the United States to challenge other punters to wager on NFL football, soccer, NBA basketball, tennis tournaments, NHL hockey and much more. The Super Bowl is the biggest and most watched sporting even of the U.S. sports calendar so we've put together a guide to the best Super Bowl apps for Android and iOS devices. These free downloads provide you with news, tips, line movements, odds, live streams and the ability to bet on the game. variety of innovative sports gambling apps for iOS and Android. Whether betting on an iPhone, Samsung Galaxy, Apple Watch or other mobile medium, sports bettors have diverse options to choose from. While regulations governing sports betting are complex in the US, there are several gambling operators allowing sports bettors to wager online. Reputable online sportsbooks include Bovada, BetOnline and 5Dimes, who have each been operating for well over a decade. Each one offers a wide variety of betting lines on major sports and competitions that feature teams such as the New York Yankees, Green Bay Packers, Chicago Blackhawks and Golden State Warriors. They also support in-play betting and cater to mobile wagering across iPhone, Android, Apple Watch and Windows Phone devices. Gambling regulations in most US states exempt fantasy sports games that involve money prizes, meaning players can play in peace. Whether banking on Tom Brady to throw touchdown passes or looking for LeBron James to net plenty of points, there are lots of fantasy sports providers to choose from. Draft Kings sits front and centre of the fantasy sports scene in the US. It runs fantasy leagues across the baseball, basketball, hockey and American football leagues, as well as the PGA Tour, the world’s largest golf tour. Major college football and basketball competitions are also on offer. DraftKings and Fanduel are the only Apple Watch and iPhone sports betting apps that you can legally download from the iTunes App Store in the U.S. Numerous apps in the US also share up-to-date news and insights to give bettors an edge over online bookmakers. Sports tipping and betting advice apps such as OLBG Sports offer free insights across a wide range of sports. Similarly sports analytics apps available via the App Store and Google Play, provide crucial pre-bet new and analysis to their smartphone and tablets. For those that like to bet and watch, live streaming on mobile devices is flourishing in the US. In fact, US tech firms have redefined the way fans and bettors consume their favourite sports online. For example, Twitter streams Thursday night NFL matches for the 2016/17 season, while the revamped Yahoo Sports app includes live streams of MLB and NHL matches. The US is very much at the forefront of the global mobile betting scene thanks to the variety on offer. US bettors can wager with bitcoin through online bookmakers such as Bovada, Nitrogen Sports and CloudBet. For ultimate convenience, bettors can use wearable sports betting apps to check lines and wager on their Apple Watch.